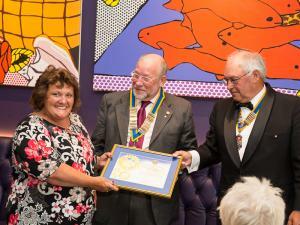 The award is made to persons or organisations in recognition of their outstanding, worthy and meritorious service to the Island of Jersey and its people, in keeping with the Rotary International motto of "Service before Self". Graeme Le Quesne was a Past President of the Rotary Club of Jersey. In June 2002 he attended the Rotary International Convention in Barcelona. After the convention, he joined with other Rotarian members of the International Fellowship of Flying Rotarians on a fly-about in Portugal. Sadly, during bad weather, his plane crashed and Graeme together with 3 other Rotarian passengers was killed. In 2003 this award was created in Graeme's Memory by Rotarians of the Rotary Club of Jersey and Rotary Club de la Manche. June 2015 Carole Anne Robins For helping numerous, charities see here for details.